Following a second hectic day at PLASA London 2013, a packed audience gathered on the evening of Monday 7th October in the AudioLab Arena to congratulate the winners of the PLASA Awards for Innovation, sponsored by Lighting & Sound International magazine. The winner of the prestigious Gottelier Award was also announced at the ceremony. 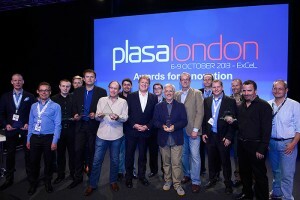 The PLASA Awards for Innovation recognise products that advance the industry by demonstrating a new style of thinking, improving technical practice or taking a key step forward in terms of safety. During the show's opening two days, 45 new products were judged 'live' by an independent panel of expert judges who toured the show floor to view each product presentation. The judges said: "The B-EYE had a 'wow' factor. It's an innovative look and a modern retake on a classic effect. It's also a fully-functional and versatile luminaire." The judges said: "It's the first fully weatherised automated profile spot. It's an elegant and aesthetically pleasing fixture that will be able to withstand any show in any environment, and be able to withstand even the British festival season." The judges said: "This is an incredibly flexible amplifier that can be used in almost any situation. It can sub-divided and reconfigured, and will work well in installations or as hire stock." The judges said: "This product uses a truly innovative approach to an age-old problem. It takes the concept of reducing materials to a whole new level and the technologies that have been adopted offer exciting possibilities." The judges said: "This is the first user manual that people will enjoy using. It has a lot of potential not just as a reference book but also as an interactive training resource. It provides a green solution that will save resources, and it solves the age-old RTFM problem." The judges said: "We were impressed with the simplicity of the user interface. It fits a point in the market where technical ability is secondary to usability, yet maintains a layer that is more familiar to a pro user. It's a totally different way of thinking and it encourages a conceptual approach to sound." The judges said: "It's the first to bring a new form factor to digital luminaires. It's conservative in its use of channels and it's a digital moving light with the simplicity of a conventional automated fixture." The judges said: "They both solve data management problems eloquently and practically. They will create new ways of understanding the massive data produced by shows and installations in an efficient and understandable way." The Award for Sustainability was awarded to TMB for the Solaris LED Flare. The judges said: "This product will save loads of energy by eliminating massive power consumption of existing fixtures including strobes, audience blinders, and wash fixtures." The judges said: "This is a really clever and long overdue approach to a common video problem. It is a manageable platform for a multitude of LED screen technologies." The judges felt that this open source protocol would be adopted across the industry because of its ease of implementation and adaptability. The judges wanted to commend this product as it shares the same innovative concept as the award-winning Flare Audio SB18C. The judges were excited by the potential of this concept. Honourable mentions also went to two products that represent impressive advancements in the state-of-the-art of entertainment lighting: Clay Paky for the Sharpy Wash 330 and Robe for the Pointe. In addition, Jim Bornhorst won the Gottelier Award, which aims to recognise product developers who have made significant and sustained contributions to the advancement of entertainment, presentation or installation technology. Chris Toulmin, event director, PLASA London, said: "Year after year we see the most fantastic products being developed and brought to market that can make a significant difference. Some are industry changers while others, just as importantly, are simply designed to make an engineer's life that much easier. This year's winners raise the bar again and we congratulate them all on their achievements."